Last Week For Q School Sign-Ups! This is the last week to sign up for Swamp Boys Q School! Also a big congratulations to Larry Johns/LJ Smokin’ on his first GC this past weekend! So my brisket scores have been down lately, Mac’s Meats didn’t have any CAB briskets, so I ordered a prime grade brisket to try to kick things up a bit. My brisket arrived via overnight shipping, I had chosen good looking ribs, butts, and chicken, and all was loaded in the cooler. It was the last day of work/school, so I was all loaded and ready to leave from work. I went to check on something in the cooler at my 10:00 Friday morning break only to find that someone had stolen my brisket, ribs and butts! It’s in a bad neighborhood but I’ve been teaching at this school for 23 years and have never had anything stolen until now. I vented on facebook and had lots of offers of help in replacing everything. About an hour later my good friend Doug Brooks of Big Bad Wolf BBQ Team texted me saying he had rounded up everything I needed and he would meet me at 6pm at the contest. Great guy, thanks Doug! It was a rainy contest and I had some overnight issues with my briskets and butts. I was able to pull it all together and get a pretty decent set of turn ins. 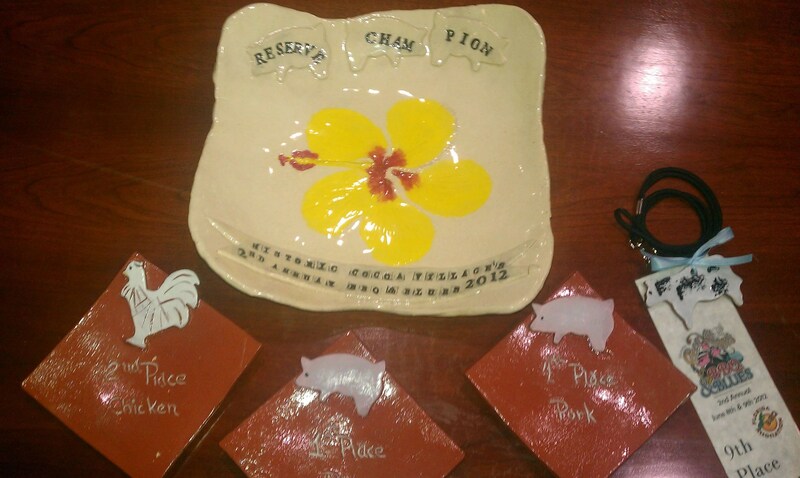 The judges seemed to agree, as I scored a 2nd in Chicken, 1st in Ribs, 4th in Pork, and 9th in Brisket. That was good enough for Reserve Grand Champion out of 34 pro teams. A nice ending to the contest!